If you want to find all the best Influencers in one place, this guide is for you. Aimed at startups to Crowdfunding owners from Kickstarter to Indiegogo, you can filter & locate writers and niche specific sites for your project. Receive the Complete Top Influencers Guide in your inbox for free! Enter your email to get access to a free PDF version of this guide - Includes all 150+ tools, recommendations and resources. Getting people to write about you plus getting backers isn't just luck. If "buzz" generated around your campaign is done well, it can soar your project towards success. We are going to share this process by taking a look at specific websites to find who could help promote your startup along with what we've learned about Crowdfunding platforms, so that you can replicate this kind of success for yourself. Last Updated on January 11, 2019. The results are not presented in any ranked order. It's notoriously hard to get listed on this site, but there may be a way round by offering a "Product Hunt exclusive". To get noticed you could offer 'Product Hunters' early access or an exclusive discount. Otherwise, pitch yourself on Twitter by giving out your url, using a short description of your project (make it catchy) + using @producthunt in the tweet. Product Hunt "Hunter Kit": Name of the product (max 60 characters), The URL you want to promote. If you have app URLs as well, put them here too, Tagline (max 60 characters), The platforms your product runs on, Twitter handles of any makers (up to 4), Media – between 5-10 images showcasing different parts of your product. If you also have a YouTube video, that’s perfect and Tell them what goodies you’re preparing to give out to the Product Hunt community, if any - free campaign listing to all Product Hunters. Similar to Thrillist, this is an online "Web Magazine for guys. Men's Style, gadgets, gear, technology, vehicles. Stuff we drool about". Quite a few KS projects are featured on the site. Mighty Goods are similar too. Swiss Miss is an alternate site for designers who mentions campaigns that she likes on her blog whilst Yanko Design is a great influencer, as they support young designers and established companies alike with their projects. A community of creative's, design lovers and trendsetters. There is a small box in the top left corner, where after joining/signing in you can submit your image, link with a category theme with a description. Also, something similar is Core77, Incredible Things, Icanhascheezburger (Geek Section) or Geeky Gadgets, if your project is geeky / creative why not try to submit there too. A site that features everything that's "awesome". From tech to design to music, this site shows anything that's interesting. If you have a site already (with a link to your campaign) then select "Product" otherwise choose "Other" and describe your product in the description box. Also, if you've got a campaign that solves a problem then submitting to Addictive Tips would be worthwhile too. Design Taxi focuses on Design, Art, Photography, Advertising, Architecture, Style, Culture, Technology and Social Media. As they state on their site, they "serve millions of tech-savvy tastemakers and decision-makers". Try the "Tips section of Techcrunch, perhaps with a creative pitch. This is Colossal is an artistic site that has ran arty type campaigns in the past. Mashable covers consumer based start-ups or topics which are of interest to their reader base. Like Technorati and Product Hunt, send them something interesting, keep it short and to the point. A similar site is the *huge* Boing Boing, Booooooom and The Next Web which features KS projects now and again. With 25M monthly visitors and 250k Email Subscribers that are Eager to discover great New Products The Gadget Flow is the world's leading product discovery platform. You should definitely give it a try. An online resource for creative professionals, focusing on design, advertising, retail, tech, travel, arts and culture. You might also want to consider the "Raw" section of Abuzeedo, which could feature your Crowdfunding project by using an introduction graphic with a click through to your campaign page. Based around Lifestyle and fashion Life Tailored is a useful paid resource. Another is Mocha Man. Run by influencer Salvador Briggman, Kickstarterforum is a huge Crowdfunding community which allows you to pitch your ideas at pre-launch level and also promote your project for free after it's launched. 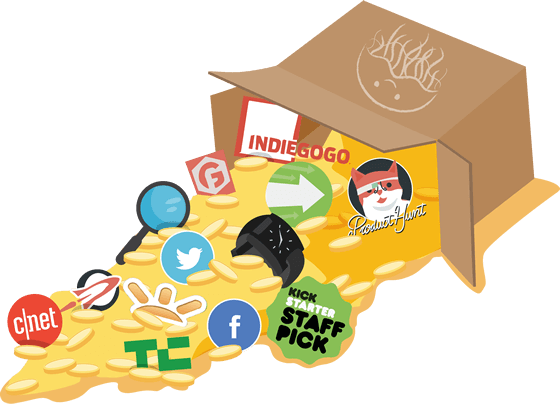 There is also an extension of sites such as Crowdfunding PR and Crowdcrux. By Brian Dean, this is a really useful SEO resource for startups, blogs and entrepreneurs. All the posts can be applied to Crowdfunding too! The QuickSprout Blog and HotJar Blog are must reads too! CoolBacker curate the coolest projects that are currently seeking backers, or have been successfully funded and are ready to order. Jamey Stonemaier has created an invaluable list of tips and advice for Kickstarter campaigns, based on his own personal successful experience of creating his own campaigns. Very useful for those new to KS and those who want further advice on their current Kickstarter campaigns. A really useful and popular tool for finding who he shared content, finding backlinks and monitoring content. This tool would be best used to find out who your competitors got in contact with and who featured them. Enventys Partners is a full-service crowdfunding marketing agency that's raised over $60 million for clients around the world. Using the power of social media, Thunderclap is a unique platform that shares a message at the same time, boosting the importance and visibility of your project. Gleam is another business growth service that you might want to check out, whilst their Gleam Blog has some excellent advice for Entrepreneurs and Startups. Dave Schneider and his team have been developing their online tool over the years and it's really good! If you want to find influencers through social media, email or other ways - this is a great tool. By reaching out to websites, bloggers and press platforms to help generate traffic and buzz around your product. This is indeed one of those vital tasks which, if done well, can soar your project towards success. Don't forget to Pre-Launch: Also known as a soft launch. Firstly you should be reaching out to friends, family, co-workers, acquaintances etc., basically anyone you think would be supportive of your pre-launch. Targeting influencers at the pre-launch stage is even better as you can get in contact with people who believe in your product before it's even launched. Collect Emails & Use Social Media: A landing page to collect emails for your campaign, email campaigns to target potential backers and a presence on the web is a must. There's no rule to say you can't use social media before your product is launched. Use Groups: Much like forums, participating in Groups can yield some great results but it only depends on how much you give in return. Get established, share advice and tips, get contacts and market your project to them when the time right. Examples: Crowdfunding Hub, I Love Indiegogo, Crowdfunding Pitch and Crowdfunding News and Insights. Using Twitter: There are many influencers who use Twitter, which can be used as starting point to get in contact and then progress further by keeping in contact down the line. However, before promoting your campaign to them, look at their interests first and remember no spamming! One way of using Twitter is to just get the word out constantly. This could be by using a scheduler, certain niche specific hashtags, direct links to what you're doing and posts upto x10 per day. Using Reddit: The key to promoting yourself on Reddit is to be a Redditor or know one. If you're a part of the community and are established, your posts will be "picked up" and be given more credence. In the mean time, the following are useful subreddits to post to: Kickstarter Subreddit, Indiegogo, Crowdfunding and Crowdsourcing. Offline Promotion: Submitting your project to the Features Desk of News Publications and Media outlets are one way to get picked up and go viral. Press from Yahoo, New York Times, CNN, The Guardian, Mashable, MTV and so on would be great! Getting a celebrity to endorse or promote your product would help, but that would probably involve the time consuming thing of contacting their agent, assistant and forking out a lot of money. Less is More: Final thoughts, I would also urge caution when contacting influencers. Some may changed their terms and conditions, whilst others won't allow you to submit Kickstarter projects or other Crowdfunded campaigns before they have publicly launched. Less is really more when reaching out, if you're not sure whether to send them your campaign, don't do it! Finally, make sure to optimise your pitching and outreach. Make it tailored to your subject, relevant to what they're doing and interesting. Comic Bastards goal sets out to help comic book readers of all kinds discover the world of comics, especially indie comics and have a Kickstarter section on the site. Bleeding Cool is an alternative that features comics, film and games. Nerdophiles is quite established with a popular Kickstarter section. With a focus on comics, reviews and real life podcasts on the issues of Crowdfunding. ComixLaunch is a useful resource for Crowdfunders and is managed by founder Tyler. Rus & Pat offer similar talks in the same style as ComixLaunch. Indie Comic Review and Geek Dad has a great section on submitting your comic/product, I think everyone should read them! If you can send a review copy BrokenFrontier whilst submitting a proper PR Kit, they could give you a mention too. Connected with Comics Alliance (that can be used as an advertising option) another link is the The Comics Journal whilst The Nerdist would get your "nerd related" project a lot of exposure in the Comic & Games niche. Overall, BoardGameGeek gets alot of traffic on it's forum pages and regularly features Kickstarter's. RPG Geek has a section that you should check out also.